Use roads? This RTP company makes them safer. The Research Triangle Park > News from RTP > Use roads? This RTP company makes them safer. If you are a motorist, you have driven on a roadway or bridge probed with a nuclear moisture density gauge created by Troxler Electronic Laboratories based in Research Triangle Park. In the late 1950s, North Carolina State University School of Agriculture asked electrical engineer William F. Troxler to design a portable nuclear gauge to measure the water content of soils in the field to help farmers stimulate plant growth. “Troxler Electronic Labs was built around my father’s idea of using radiation in industry for non-destructive measurements of materials,” says Billy Troxler, president & CEO of Troxler and son of founder William F. Troxler. The nuclear density gauge originated for farmers quickly became a necessity to the construction and road building industries especially after President Dwight Eisenhower signed the Federal-Aid Highway Act of 1956. The bill created a 41,000-mile “National System of Interstate and Defense Highways” that would, according to Eisenhower, eliminate unsafe roads, inefficient routes, traffic jams and all of the other things that got in the way of safe transcontinental travel. “The implementation of the Federal Aid Highway Act really kicked off the growth of Troxler,” Billy Troxler says. The portable device measures the moisture content and density of engineering materials with radioactive materials. Small amounts of radioactive material are housed in the gauge, which is used to measure the density of soil and compaction of highway materials at construction sites. Troxler had his critics. The emission of that kind of energy scared people. “That was always a challenge for him,” his son explains. He had to design a product that was inherently safe by shielding the small radioactive source so when you picked up the device, it automatically shifted to the safe position. Like its predecessor, the instrument helps with quality control of asphalt, crushed rock and soil preparations from structures ranging from highways to hospitals. This device helps taxpayers get their money’s worth when it comes to construction. The one-man electronics operation incorporated in 1962 is now the worldwide leader in precision quality control and measurement equipment for the highway and construction industries. Troxler, located in Research Triangle Park in 1974, employs about 85 people with offices in the United States, China, Germany and 50 distributors around the world. The company won the U.S. Department of Commerce’s coveted “E” certificate for Exports in 1972 for an outstanding contribution to the Export Expansion Program of the United States of America and the U.S. Department of Commerce Export Achievement Certificate in 2013. The most recent award was given because during a 10-year period, Troxler sold its products to 163 different countries. “All countries building roads are using Troxlers,” he says. “They have them everywhere.” We don’t call them nuclear moisture density gauges,” says Billy Troxler. “Around the world, they are called Troxlers.” He laughs comparing them to Kleenex, which for most people is synonymous for tissues. Jim Sawyer, a GeoMaterials training engineer for NC DOT, says that about 80 percent of the nuclear gauges in DOT’s inventory are made by Troxler. “Troxler is the king of it,” he says adding that the founder started the company in his basement. The success of Troxler has spawned two other competitors in the Raleigh-Durham area. Troxler’s customers include the U. S. Federal Highway, DOT departments around the country, paving companies, engineering firms and construction companies all over the world. What’s next for the company? 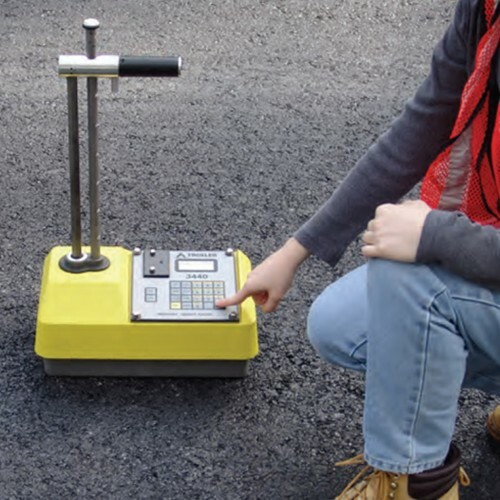 The Troxler Moisture Measurement System measures in real time the moisture content of asphalt and concrete. This way you get a more consistent mix, which will save time and money because you can eliminate mixes that do not meet specs due to excess water content of aggregates entering the asphalt or concrete mixing plant. Troxler continues to pave the way to better and long lasting roads.